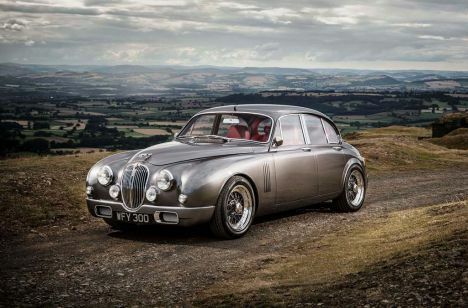 A unique Jaguar Mark 2 redesigned by Ian Callum, Director of Design at Jaguar Cars, and reengineered by leading restorers Classic Motor Cars Limited (CMC) has been unveiled at the opening of the company’s new headquarters in Bridgnorth, Shropshire. This exciting 18 month joint project between Ian Callum and CMC has endeavoured to retain the integrity of the original Mark 2, whilst making it even more exciting in shape and performance. The car has been redesigned by Ian for his own personal use and, working with CMC's engineers, it now boasts a huge number of aesthetic and technical modifications that make this a practical, reliable, enjoyable and exciting everyday vehicle. Featuring a modified and uprated 4.3 litre XK engine, 5-speed manual gearbox, unique independent rear suspension and upgraded front brakes, the Mark 2 by Callum provides an intuitive driving experience. Commenting on the specifications, Ian said: “The stance of the Mark 2 is already excellent, but I wished to make it even better. The car’s form is now 30mm lower and sits on 17” split rim spoke wheels. The bumpers are now part of the overall form. It is a fine balance of extracting and adding. The suspension has been designed and reengineered by CMC. The front incorporates a bespoke power assisted rack, uprated coil springs, roll bar and wishbone bushes, adjustable dampers and solid subframe mountings, repositioned to improve anti-dive characteristics. The unique independent rear suspension now includes uprated coil springs, blade control wishbones, outboard disc brakes, an anti-roll bar and adjustable dampers. The car has been fitted with Clarion’s NZ502E single DIN multimedia station, a high technology in car entertainment system with a 16cm flip-out touch screen, amongst other features, and component loudspeakers in specially-designed housings. The cabling has been provided by VDC Trading, as used in the world’s top recording and mastering studios, such as Abbey Road. UK car exports race to five million! Successor to superfast Caparo T1 on the way!